It’s been a wild last 12 hours and every pundit in college football battled back and forth on who should make the College Football Playoff. Most everyone agrees that SEC Champion Alabama, ACC Champion Clemson and undefeated Notre Dame are the top three teams. 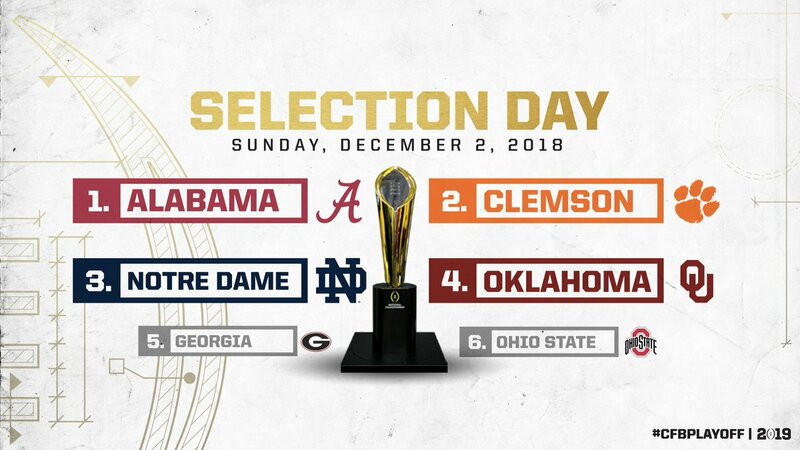 But who should be number four, SEC runner up Georgia, Big Ten Champion Ohio State or Big 12 Champion Oklahoma? Sorry, Pac-12, you’re out. ESPN did everything they could to convince the nation that two-loss Georgia should be in, because eye-ball test. If not Georgia, then Ohio State. Because…well, I’m not really sure. Ohio State lost to unranked Purdue by 29. Compare that to the Sooner’s loss to 19th-ranked Texas by a field goal, and it’s no contest. Not to mention, the Sooners avenged that loss in the Big 12 Championship. In the end, despite ESPN’s best efforts, common sense prevailed and the Playoff Committee selected Oklahoma. The Sooners will face Alabama in the Capital One Orange Bowl on December 29th.